An acute shortage of public buses on different major routes in Hooghly district is expected on the day of the Brigade meeting, being touted as the mega Opposition rally. People going about their daily work, students and teachers may have to wait for much longer periods to avail the very limited number of buses to reach their destinations since most buses will be headed to the Brigade Parade ground in Kolkata. The Hooghly district bus, minibus owners association working president, Mr Debabrata Bhowmik said, “Chinsurah bus stand serves as a vital connection point to the various destinations in the entire district. Daily bus commuters avail bus services from here to Arambagh, Goghat, Kamarpukur, Dhaniakhali, Jangipara, Memari, Kalna, Konnagar and as far as Bankura district. said all buses from Serampore sub division on route nos 40, 26, 31 and 12 to Andul, Sehakhala, Begumpur, Tarakeswar would not be available for transportation of the public since all buses would be used to ferry people to the Brigade meeting in Kolkata. The daily commuters on that day may have to depend on multi-leg trips in autos and totos to reach their destinations, which may be somewhat expensive for some of them. However, normal train services will be able to meet a part of the rush of the daily bus commuters. 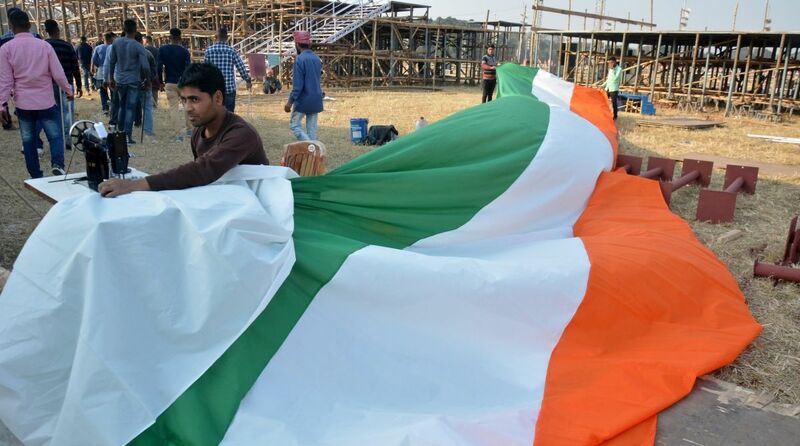 Meanwhile, preparations are on in full swing at the Central Park Mela Ground for the mega rally. To provide lodging facility to around 35,000 people from across the state who have already started flocking to the ground in large numbers, 46 enormous tents have been put up. The tents have been numbered and equipped with basic facilities like lighting, pedestal fans, bedding etc. An enormous dining area of 15,000 sq ft has also been put up to prepare and serve food. As many as 250 toilets have been set up too. supplying water have also been made. Three agencies, namely South Dum Dum, Kolkata Municipal Corporation and Bidhannagar Municipal Corporation will supply water at the ground,” said the official. While two fire engines have been stationed for the event, eight motor bikes and 25 fire personnel are on constant round of the entire premises to provide immediate services in case of any incident. A large number of police personnel from both Bidhannagar Commissionerate and state police department are on round-the-clock vigil. Fire Minister Sujit Bose visited the ground on Wednesday to oversee the preparations. Trinamool Youth Congress president Abhishek Banerjee also reached there and spoke to party supporters who had mainly come from North Bengal. According to the officials and volunteers on the ground, a large number of people came from Bankura and Barrackpore. “We boarded the bus at around 3 in the morning from Chengizpur to catch the train at 5 a.m. from Balurghat,” said Asutosh Mahato, who has come from South Dinajpur to hear chief minister Mamata Benerjee’s address on 19 January. “While my father stayed behind to take care of the house, around 70 people from my village have come to be a part of the meeting at Brigade Ground,” he added. Apart from Central Park, arrangements to accommodate people from Junglemahal, Purulia, Bankura and West Midnapore have been made at Geetanjali stadium and at the open air stadium at Uttirnya. The dignitaries coming to attend the rally will be reportedly housed at the newly constructed state guest house, Saoujanya. Among those who have confirmed their presence at the rally are former Prime Minister HD Deve Gowda, former J&K CM Omar Abdullah, former Uttar Pradesh CM Akhilesh Yadav, former Maharashtra CM Sharad Pawar, former Arunachal Pradesh chief minister Gegong Apang, Mizoram’s Opposition leader and DMK leader MK Stalin. MP Abhishek Manu Singhvi and senior leader Mallikarjun Kharge will be representing the Congress. Janata Dal (Secular), Aam Aadmi Party (AAP), Nationalist Congress Party (NCP), and the People’s Democratic Party (PDP) are also slated to attend the event. Around 1,300 microphones have been put up at Brigade Parade ground, on Red Road and stretched upto Esplanade East.